of ATD Ireland in 2×17=34 events! Event 11 – The 30th Famine Walk participants say “Stop Poverty”. Surprise of 2017 – “Playing For Change” supports the ATD Stop Poverty Campaign with the Song Around The World “With my own two hands”! prepared by ATD for the Irish End Poverty Day Committee! Join the ATD 2018 Campaign “Let’s Walk As One to Stop Poverty”! Participation and Human Rights to Leave No One Behind! ATD reacts to the draft Irish SDGs plan! The ATD Ireland and 17 October Committee submission to the National SDG Implementation Plan welcomes the December 2017 first draft of the Irish Agenda 2030 Implementation Plan. The short time-frame and the limited circulation for the consultative process will probably impact its quality. We hope that the Governmental team which will finalize the plan will be able to take into account the various inputs. ATD Ireland is seeking a motivated person to join their small and dynamic team for a 3 month long internship. The internship is designed to give an opportunity for dedicated and talented individuals to gain experience working for the protection of human rights and the promotion of the sustainable development goals through a wide variety of grass roots projects. This internship is unpaid however upon successful completion participants will be considered for an additional three month long training programme which includes an accommodation payment and a monthly stipend. – The launch and the implementation of the project “Your Rights are written in Stone” ahead of the 10th anniversary of the Human Rights and Poverty Stone unveiled near the Famine Statues on Custom House Quay. – The organisation and facilitation of workshops for youth groups as part of the “Ireland, I have a dream” project marking the 50th anniversary of the assassination of Martin Luther King. – The launch and the implementation of the project “The Leave No One Behind Conversations”. This series of debate is designed to reinforce the citizens and states’ commitments towards the 2030 Sustainable Development Agenda and the pledge to leave no one behind. So That Everyone Is Able to Celebrate! You will find below our International Winter 2017 Fundraising Appeal to support the work of the Overseas ATD Volunteer Corps! If you wish, please share it with your contacts and friends. This would be a great support to our work in Ireland and beyond. We thank you in advance and share with you best wishes for the season’s celebrations! This message is an invitation to support ATD’s grassroots work with the most disadvantaged children, young people, and families in order to build relationships of solidarity between them and people of very different walks of life. Your international gift can make a difference. You can also make a donation to ATD Ireland here. One Christmas Eve, a man named Bob said this to Ronald, an ATD volunteer. How many people might recognise themselves in Bob’s situation? Every year, Christmas leaves painful scars on some people, while others enjoy gifts and glittering trees. “Bob is the person who welcomed me when I first came to ATD. I have to admit that I was sometimes quite afraid of Bob. I grew up in the countryside and I had simply come to help out. With Bob, all of a sudden, I found myself staring into the deep abyss of poverty. “Bob always hated Christmas. It made him want to shout with rage. And yet it was Bob who taught me what Christmas is. It’s with him that I learned, year after year, that Christmas cannot be Christmas if someone is suffering. It can’t be Christmas if people are cut off from their family. It can’t be Christmas unless everyone is able to celebrate. or whether you follow a religion or belong to a group. ATD’s Volunteer Corps members make a long-term commitment alongside people in deep poverty. To continue to make this possible, we need help from all those who agree that the injustice of extreme poverty must end. Thank you for your support and your donations. Wishing you well in this holiday season. The ATD Christmas Raffle! Join the challenge to keep our 2017 accounts in the green zone! From the 15th to the 31st December 2017 ATD needs to collect €3,000 to make ends meet. This means finding 300 friends and supporters ready to offer us the cost of two pints during the coming “Christmas” month! Help us to meet the challenge! 1 – Enter the ATD Special Christmas Raffle for the cost of pint and invite your contacts to do so! For every €5 donated you will secure for yourself one entry ticket in the raffle! Donate €20 and your name will appear on 4 tickets in the draw bowl on Monday 1st January (New deadlines!!!!)! If many people donate a small amount we may reach quickly our €3,000 target. So please invite people you know, relatives, friends, to make a gift to ATD! – 1 special pottery creation by Carol Betera and the Botanic Pottery, a published illustrator of children’s books (See Hugo and the Sunshine Girl and more). In 2017 Carol donated drawings for the book “If Only you knew”. – T-Shirts, Books, Calendars, Greetings cards and more to come! Donate before Monday 1st January 2018 at 12noon to be part of the Draw! You will be informed of the result by Tuesday 2nd January (new deadlines)! 3 – Show love and solidarity! ATD Greeting Cards are now available! 4 – Make of “If Only You Knew” a hit present under your Christmas tree! If you donate €15 or more, you will enter the raffle and we are happy to send you a copy of ATD’s new book “If Only You Knew”. This book is a very appropriate Christmas present. Its message of hope, resilience and liberation are just what the day is about! Donate and send us an e-mail to get the book! If you decide to donate €30, we will send you 3 copies of the book! 5 – Take the leadership! For the 3rd time, our annual “Long Walk to Freedom” took place on Human Rights Day 2017, the 10th December. This year again the walk stopped at significant place in Dublin 1. Here you can download the guide to the walk and below discover the pictures taken at the different stops! Equal Right to Health for All! ATD and the Community Platform raise awareness on Health Inequalities! On Universal Health Coverage Day the Community Platform with the support of ATD Ireland as published a leaflet and poster which highlight shocking facts which show that the equal right to health is being denied to those experiencing poverty, social exclusion and inequality and to call on the Government to bring about change. It has also published the final report from the “Health as a Human Right” seminar held jointly by the Community Platform and All Together in Dignity as part of the “Our Voices” project in June 2017 which is available to download here. The leaflet and poster call on everyone to take action by informing themselves of the reality; demanding that the Government implement the reforms outlines in the SlainteCare report; remind the Government of it’s commitments in Health Ireland to addressing health inequalities and promote the Public Sector Duty which places a legal duty on all public sector bodies have regard to eliminating discrimination, promoting equality and protecting human rights in their daily work. Download the Community Platform Press Release here: Equal Right to Health for All. Download the Leaflet and the Poster. These materials are being disseminated as a follow up to Six principles for an inclusive health policy published in December 2016. 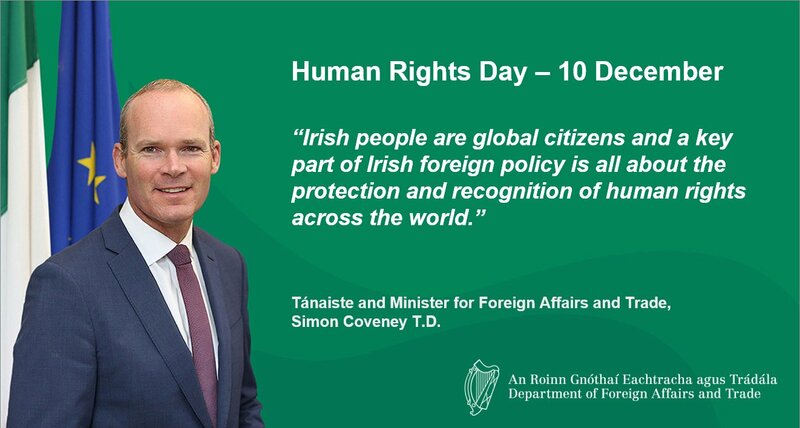 Human Rights Day 2017 – Our call on all Senators and TDs! of Human Rights starts at home! A few hours before the Human Rigths Day events organised by All Together in Dignity in the National Gallery of Ireland and in the Dublin North Inner City, we allow ourselves to call on you to make rights real for all the Irish citizens facing for years consistent poverty and marginalisation. Here are the four steps we invite you to consider in order to walk at home, the talk of the Tánaiste at the occasion of the Human Rights Day 2017. 1. To implement the 2012 UN Guiding Principles on Extreme Poverty and Human Rights. Ireland just adopted a strategy on Business and Human Rights based on the 2011 UN Guiding Principles. We invite you to initiate a similar process based on the 2012 Guiding Principles. This work could inspire both the new Action Plans for Social Inclusion and the Agenda 2030 implementation strategy to be adpoted by Ireland in 2018. 2. With all the other members of the Irish Economic, Social and Cultural Rights Initiative, ATD Ireland is calling on you to accept the recommendation of the Irish Constitutional Convention. In February 2015, the citizens gathered in the Convention asked you to strengthen the protection of Economic, Social and Cultural Rights in the Irish Constitution. In the context of the current homelessness and housing crisis, an important first move would be to prepare a referendum to introduce a right to housing in Bunreacht na hÉireann. Many countries around the world did it! We believe Ireland can do it too! 3. With all the other members of the Community Platform, we can’t accept the severe health inequalities experienced by the most vulnerable in Ireland. Poverty is an early death sentence. On Human Rights Day we call on you to make sure both Sláinte Care and the Equality and Human Rights Public Sector Duty are implemented in a robust way with a priority delivery for the one who suffer most from the inequalities in the health care services. 4. On 9th November 2017, a majority of Dáil Éireann supported Deputy Jim O’ Callaghan and Deputy Fiona O’ Loughlin Private Bill to amend the Employment Equality Act 1998 and the Equal Status Act 2000 by prohibiting discrimination on the basis of a person’s social and economic background. Today we call on you to support this process and recognise this new “discrimination ground” in the Irish equality laws framework. We believe this is a needed step to improve access to and delivery of Human Rights provision for the most vulnerable. Show love and solidarity! ATD Greeting Cards are now available! Contact us by e-mail or phone to 01 855 81 91 to get details about the cards available! Donations: Now donate just €50 Cents and we offer you 1 card! € 5 and we offer you 10 cards!